One of the great downfalls of the common 4G63 engine swap, is that so many people begin them and never finish. It seems that enthusiasts spend endless money gathering parts and information, they get the engine installed in the vehicle, begin the wiring, and promptly throw in the towel. The vehicle then gets parted out and the engine swapper moves on to something else. I have seen this around 6000 times, probably more, and it hurts my soul. Rather than get sad about it though, I got inspired to help. See, the common denominator in most of these 4G63 swap part-out’s was the wiring harness. If you have never dug into one before, it can be incredibly overwhelming, especially when you pull the electrical tape off. 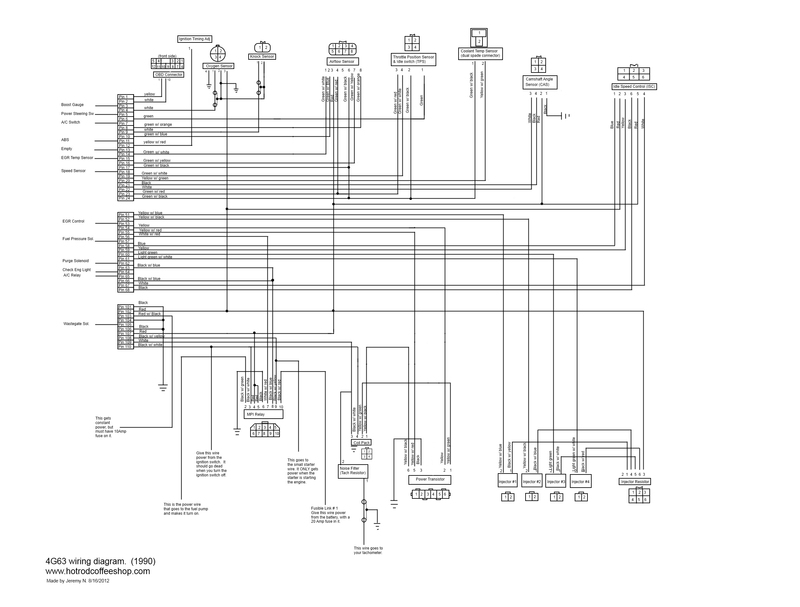 The once organized DSM harness becomes a spiderweb that has no beginning or end. WTFUXORS ensues. So, in the interest of helping fellow 4G63 engine swap enthusiasts, I created a couple of wiring schematics. 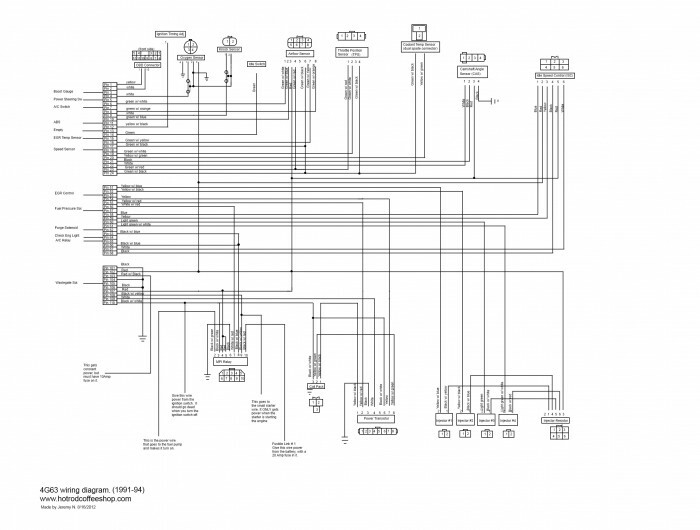 One is a wiring diagram for a 1990 4G63 DSM. The other is the wiring diagram for a 1991-94 4G63 DSM. Each one shows how the wiring harness needs to be setup for an engine swap. Most importantly, it shows the MPI relay, which is the most challenging part to understand. With that said, hopefully some people will find these diagrams beneficial, and if so, let me know. If not, let me know what I can do to improve them. I’m happy to help! You really only need power and ground from the galant harness,so it should be pretty easy. Feel free to share this post with anyone else you know that could use it! Jeremy, I left a message for you on DSMTuners. Hopefully you can get around to reading and replying to it. Thanks for all the help you’ve given me! Alex – hop into the hotrodcoffeeshop forum and introduce yourself. Maybe somebody in there will be able to help you out. Great question. I imagine that it is very similar, though I am not sure how close it is. If I was a betting man (which I am), I’d bet that the diagram is the same, but the wiring colors are different. Hi, I want to thanks you for the work you did on the 2g dsm diagram, I have use it to help build a full harness. I have found a few errors though and would like to contribute to correcting them. Please contact me. I have thoroughly tested and confirmed the changes. hello can you help me out on my wiring 4g63t 2g. thank you! hey bro is this 4g63t 2g???? thank you ! Hello!I really need some help…. !I have a Galant g 7 v6 2.5 liter with 4wd and 4ws and i can’t find the wiring harness diagram on the internet! !I need it becouse i what to change the engine with a 4g63t.Please help! Is the turbo, non turbo, and turbo awd 1g diagram and ecu the same? Swapping a 4g63t that came out of a 91 eagle talon tsi awd, will this diagram work? please help! They are somewhat the same, but not exactly. The turbo cars have additional wiring that the non-turbo doesn’t have, like knock sensors. You can easily convert one to the other if you have the extra connectors though. I’ve done it several times with great success. AWD vs. FWD doesn’t matter. They are the same. You can plug a non-turbo ECU into a turbo car and it will run, though not well, so the wiring is very close.